Well, we seem to have blinked and a very busy half term has flown by! Thank you children for being superb this school year so far – you are all working so hard and are a joy to be around each day. Thank you to all the staff for all the exciting and fun learning opportunities that you have planned for your classes and the valuable contribution that you make to our school community. 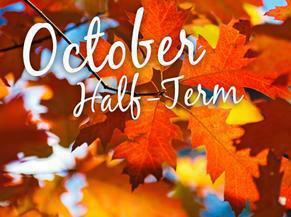 I wish you all a relaxing and refreshing half term break.